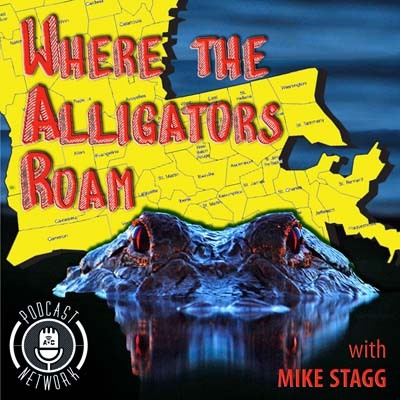 Where The Alligators Roam is back on the ether, if not the air. The show is now done from the downtown Lafayette studios of Acadiana Open Channel. It streams on Cypress Street Radio on Sunday afternoons at 5 p.m. The podcasts will be available on Mondays. John DeSantis is a reporter based in southeast Louisiana. He uncovered a story about the violent end of a sugar cane labor strike in the nearby town of Thibodaux that occurred in 1887. He wrote about what little he could find of the record of the events which, according to the official count, resulted in the deaths of eight people ” all of whom were black sugar cane workers. The story led to a book contract which pushed DeSantis to dig deeper into the story. With the help of an archivist at Nicholls State University in Thibodaux, he was able to locate the names of the eight people who were listed as those killed in the streets of the town on a single day ” November 23, 1887. That led to yet another discovery which enabled him to get to eyewitness accounts of the massacre. DeSantis believes the number of black workers killed that day in Thibodaux by white vigilantes was between 30 and 60. Most were involved with the Knights of Labor strikes that had originated in Terrebonne Parish the year before, but carried over into neighboring LaFourche Parish in 1887. The book is a slim volume that unveils a wealth of detail about labor and raced relations in post-Reconstruction Louisiana and the violent events of that day in Thibodaux that reverberate still today. DeSantis is now engaged in the effort to locate the place where the victims of the massacre were buried. Moms Demand Action for Gun Sense in America was formed in the aftermath of the Sandy Hook Elementary School shootings in December 2012. The group, which now has approximately 5 million members has focused its energies on handgun laws and safety. While it has had success at the state lever (even here in Louisiana), it appeared to be fighting waves of public indifference to the hundreds of mass shootings that have happened since those pre-Christmas days when 20 children and six adults were gunned down at the school in Newton, Connecticut. The murder of 17 people — 14 students, one teacher and two coaches — last week seems to have broken through the numbness brought on by mass shootings between Sandy Hook and the shootings at Marjory Stoneman Douglas High School last week. The very public outcry of survivors of the shootings touched off waves of anger among young people which, in turned, appeared to shame adults whose inability to convince their lawmakers to pass laws to prevent further mass shootings allowed the mid-February murders to take place. Rhonda Gleason is a teacher and parent. She’s been active in the Louisiana chapter of Moms Demand Action for more than two years, playing mostly defense in this state where the NRA is actually a designated business partner of the State of Louisiana. The Parkland, Florida, shootings have given the movement for common sense gun laws here and in other states new momentum. Perhaps America’s conscience has been re-engaged on the gun violence issue. Propelled by the new energy and outrage of young people who are tired of being targets, those opposing the NRA and their gun manufacturer patrons might now have the chance to pass laws that will break the current cycle of mass shootings that has seemed unending at times. At the start of 2018, we are nearly three years out from the formal start of the redistricting process that will redraw lines for every legislative body in Louisiana ranging from town councils and school boards, to parish councils, the Louisiana Legislature and our six congressional districts. The process formally kicks off at the end of 2020 when the results of the United States Census conducted that year will be released. In 2021, the redrawing of district lines will fall primarily on the legislative bodies that will then elect members from. But, before we get to that point, Louisiana will elect a new legislature in 2019 and that body will redraw not only its own district lines, but that of our congressional districts and, maybe, our Supreme Court districts. Dr. Brian Marks teaches political geography at LSU in Baton Rouge. He was a panelist at Fair Districts Louisiana’s Redistricting Summit held at the Lod Cook Alumni Center just off the LSU campus on January 19. In this conversation, Dr. Marks (who is programming director at WHYR radio station in Baton Rouge) talks about the various kinds of gerrymandering that has been used over the decades in attempts to lock in or lock out political advantage. We also talk about some earlier redistricting processes in Louisiana and the prospects for the use of an independent commission to carryout redistricting. Representative and House Speaker Pro Tempore Walt Leger III said at the summit that he believes Legislators should not be in the business of choosing their constituents, that it should work the other way around. He didn’t get much support for the idea from fellow Democrats. Removing politics from a political process is easier said than done. Louisiana’s current congressional district map was redrawn with the explicit purpose of carving out a new seat for Congressman Charles Boustany whose 7th District was taken away due to the more rapid population growth in other states. Boustany won the redrawn 3rd District in a 2012 race that pitted him against freshman Congressman Jeff Landry (who is now state Attorney General). Black legislators now believe they painted themselves into a corner with the 2011 redistricting which saw many minority majority districts that had super majorities of Black voters in those districts. The problem was, as Rep. Patricia Haynes Smith said at the summit, “while you’re getting seats that are safe for African Americans with that approach, you’re also creating white seats where people elected don’t have to take into account the interests of Black voters. We cover a good bit of ground here. I think you’ll find it worth your while.